Recently, I attended the Kona Ride event, and learned about the new spec for the Rove ST. The Rove lineup received a total overhaul for the 2018 model year, and we did well with them at 718 Cyclery. 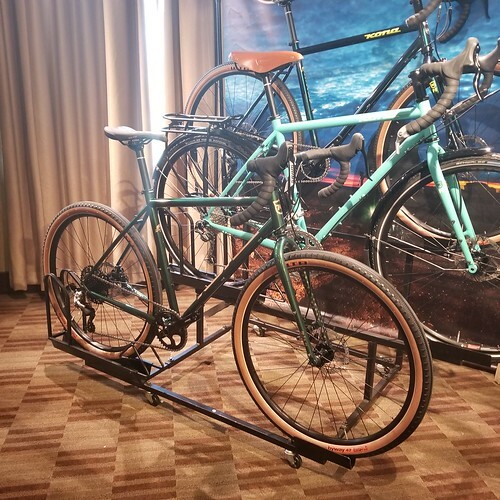 There were/are 6 bike sin the Rove lineup, and we sold all of the except the ST model last year...reason being we felt it landed where alot of other bikes we have are. At 718, our customer is usually someone who loves in an apartment, and doesn't have the garage/storage space for the 5 bikes he/she thinks they need. We specialize on what we call "capable" bikes; bikes that can be used for camping, commuting and fitness. We are excited about the new 2019 Rove ST, as it really fits the above bill...especially at $1599 It runs a Rival 1x11 drivetrain on 650b rims, laced to thru-axle hubs. More and more, we are seeing the "normalization" of the new/old 650b wheel size, and we couldn't be happier. This size provides so many advantages to the multi-surface rider (and one could argue the NYC streets are of the multi-surface variety. My fiorst imopressions as that this is a very capable bike, lightweight and at a great price for a Rival-equipped bike. I am looking forward to putting tghis bike through its paces day-to-day, and getting ready to use it on Micro-Tour 5. In addition, Kona has lent us a fleet of 3 of these v=bikes for riders to use on this trip!